New Delhi, April 12: Debt-ridden Jet Airways has finally come up statement announcing to stop all its international flight from April 12 to April 15. However, the cash-strapped airliner mentioned that it is currently flying less than 50 domestic flights, with 16 operational aircraft available for flying. 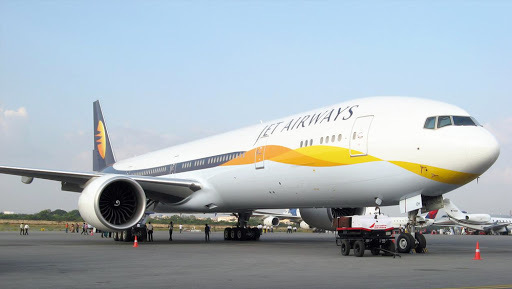 Announcing the decision on the cancellation of international flights, Jet Airways spokesperson said on Friday, "Jet Airways has cancelled its international operations from 12-15 April, 2019. It is working to minimise guest inconvenience using its 24x7 Contact Centre, Guest Relations & Social Media response teams, to handle schedule adjustments." Jet Airways Crisis: International Flights Cancelled for Next Two Days; Amsterdam, Paris & London-Bound Planes Affected. Adding on, the spokesperson also informed, "In parallel, the airline’s management and its key stakeholders including its consortium of lenders, continue to work closely towards resolving the current situation." Meanwhile, the aviation regulator DGCA said on Friday informed, "Jet is currently flying less than 50 domestic flights. The airline has 16 aircraft available with them for flying." With the crisis situation deepening in the aviation sector, the Prime Minister’s Office has called an urgent meeting to discuss the situation, official sources said. However, the official not give the actual number of aircraft that are currently flying. Until last week, the Jet Airways operated 26 aircraft, including Airbus A330s, Boeing 777s, 737-800 and ATRs, to various destinations like London, Toronto, Singapore, Amsterdam, Paris, Bangkok and domestic sectors like Mumbai-Delhi, among others. To help the passengers, affected with the Jet Airways crisis, SpiceJet on Friday announced it will induct 16 Boeing 737-800 NG aircraft on dry lease to bring down flight cancellations and expand the airline’s international and domestic presence. Spicejet informed, "SpiceJet will induct 16 Boeing 737-800 NG aircraft on dry lease and has applied to the Directorate General of Civil Aviation (DGCA) for a No Objection Certificate (NOC) to import the aircraft. Subject to regulatory approvals, the aircraft would begin joining SpiceJet fleet in the next ten days."